Contd. from The Fellowship of Annapurna. The fellowship, now reduced to 6 hastily made its way towards the fish tailed mountain. It was a bright and clear morning. There was just a hint of that gentle breeze cutting across the valley. The valley had also closed in considerably. 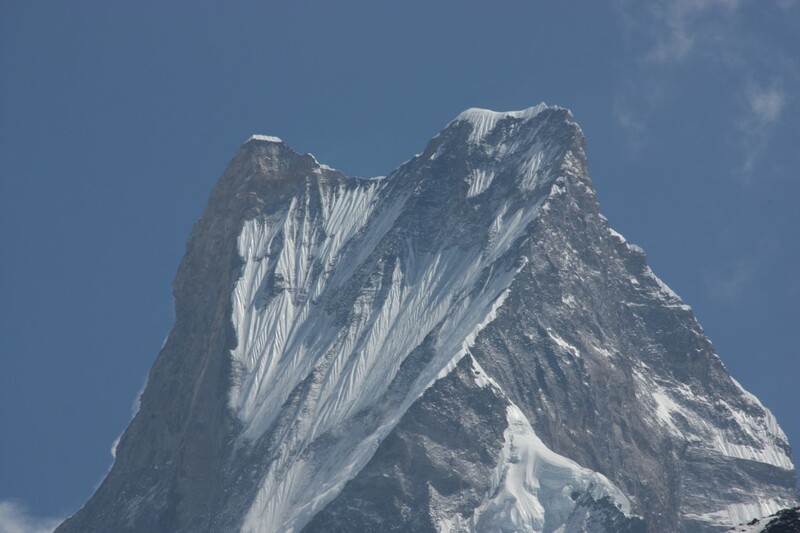 With its jagged faces on both sides riddled with open spouts high above. These had to be those avalanche spouts we had heard of at Chomrung. From where without any warning one would hear a sudden and loud thunderclap and then a swoosh of ice, rock, snow and other mountain debris would hurtle towards the ground, over you if you were unlucky and far away on the other side of the stream if you were not. This meant one’s gaze was perpetually fixed upwards, the senses alert for that ominous sound. Even when you were forced to look down and watch your step as you walked, the eyes at the back of your head kept a lookout. On the way. The first break for hot lemon. One that already happened, which we had to walk through. Meanwhile, the two peaks of the fish tailed mountain stood high and majestic on the right, motionless, glistening to the naked eye. There was just hard ice on them. 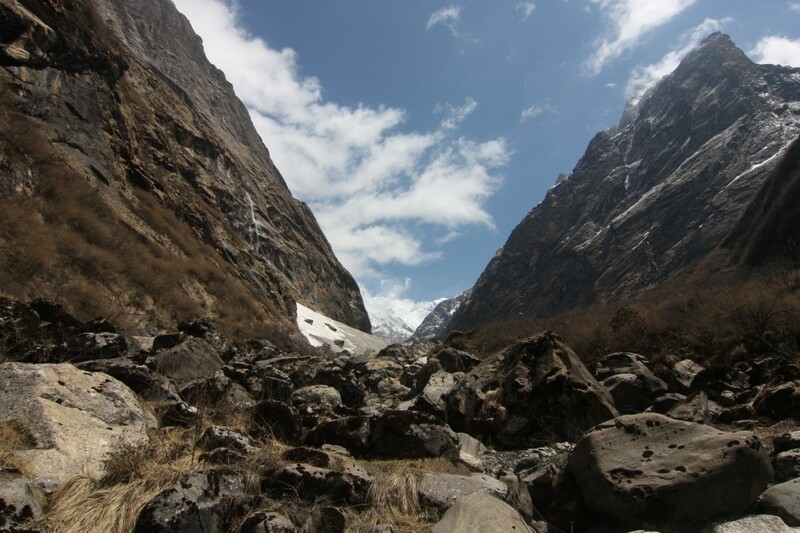 Clambering over massive boulders, slushy streams, wooden bridges over a gushing river, the fellowship walked on, separated from each other, looking for that elusive base camp. They didn’t know it yet, but it would be a pretty long walk. The valley through which they walked seemed miles long and it was tough to even figure the horizon. The company kept was diverse now. An international walking community all guided by the one thing everyone wanted to see. Annapurna. The world’s 10th highest. As the hours ticked over, the bright skyline soon turned grey. The wind picked up crisscrossing the pockmarked terrain and those who walked through it. The gradient was a gentle slope upwards with the trail rising and falling ever so often. Way ahead I could see Ramnik, Sweta, Varun and KB. Kalpak, Ketan and Mahesh brought up the rear. Kalpak’s right knee was giving him trouble too. But he had persisted with it and had kept moving, slow to the step. The weather meantime didn’t look promising at all. It had started drizzling yet again. Cold rain, to the touch. I blew out hot body heat into the moist surroundings. When there’s rain in the mountains, a heavy bout of hailstorm or snow can’t be far behind. I hoped this would start once we had reached the safety of the lodge. “How far to MBC?” I asked a sherpa guide who was headed in the opposite direction. He looked at me and replied, “At your pace, another 1.5 hours”. I wondered if that was good or bad as I moved on covering ground rapidly. As I neared the 1.5 hour mark, I spotted something that looked like a structure emerge out of the misty grey darkness and the low clouds. 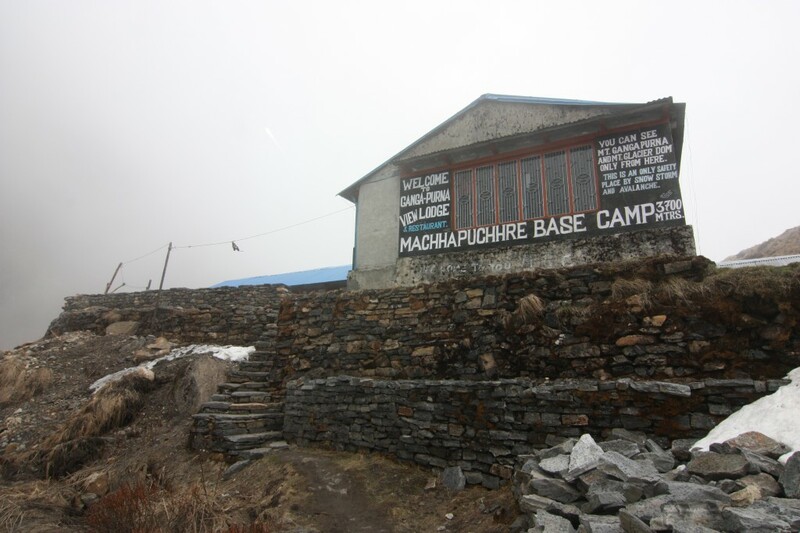 The wet white paint on the structure read Macchapuchhare Base Camp. Hell, I had reached. There was a quiet sense of relief and jubilation. This is the lodge where we would stay. It was also the only one I could see. I climbed the last 20 steps up a steep incline and crashed through the door only to find myself in a snug dining hall. Hot Lemon I shouted. “And something to eat please”. The hot lemon was soothing to the throat and I felt a warm surge of energy within as the energising liquid rushed through my veins it seemed. Soon a quarter of an hour turned half and there were no signs of the group. Where was everyone? Was I in the designated lodge? I stepped outside in the rain once more to explore the surroundings. Around the bend of the lodge, where I was stood a block of 3 additional lodges. Damn, the group surely had to be in them. And sure enough. I was right. They were hanging out in the porch waiting for their hot beverages, grinning at me as I walked towards them. The fish tailed mountain, the top now completely obliterated from view courtesy the terrible weather was on our left. It seemed extremely close. Maybe a few odd kilometres as the crow flew. It was 12.30pm in the afternoon. But seemed like late evening. 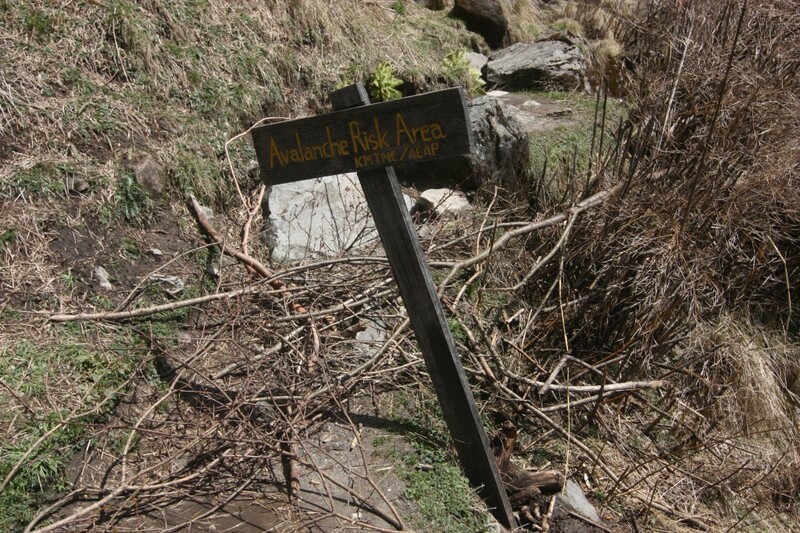 We were on the edge of the famed Annapurna Amphitheatre. From hereon we would just have icy peaks for company. As I stood on the porch, soaking in the scenery, all of a sudden there was a terrible rumble, a thundering crack and roar as though the mountain giants had awakened and taken note of our presence in their midst. Snowfall! Our worst fears were coming true. We retreated into the warmth of a single room. All 6 of us. The sleeping bags were pulled out. We needed them. While the others sank into them, I kept pacing in and out of the room. I couldn’t stand still. Or even lie down. I guess the nervous energy didn’t allow me to rest. I also didn’t want the body to cool down. It was nearing 2pm. The outside was stark white. 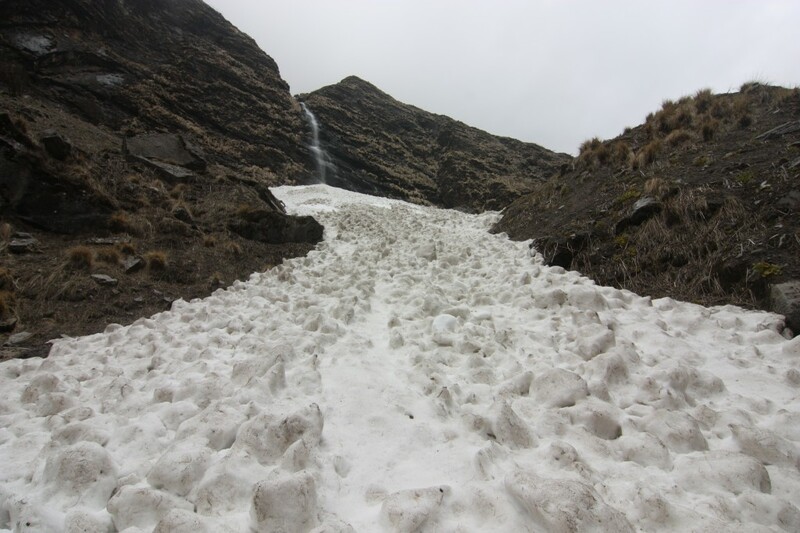 The snowfall had gained intensity and showed no signs of subsiding. It just kept coming hard at us. Deep throated rumbles echoed throughout the valley. It was difficult to pinpoint the source as the sound kept rebounding off the mountain walls. These were goddamn avalanches somewhere near us. Either from the top of the surrounding peaks or loose snow giving way somewhere. Eerie. It was a complete whiteout with zero visibility. Couple of hours passed us by. And yet there didn’t seem to be any respite. The snowfall seemed to be the worst of the season. And Annapurna was attracting all of it. The mountain was known for its miserable weather and resultant avalanches down its face. 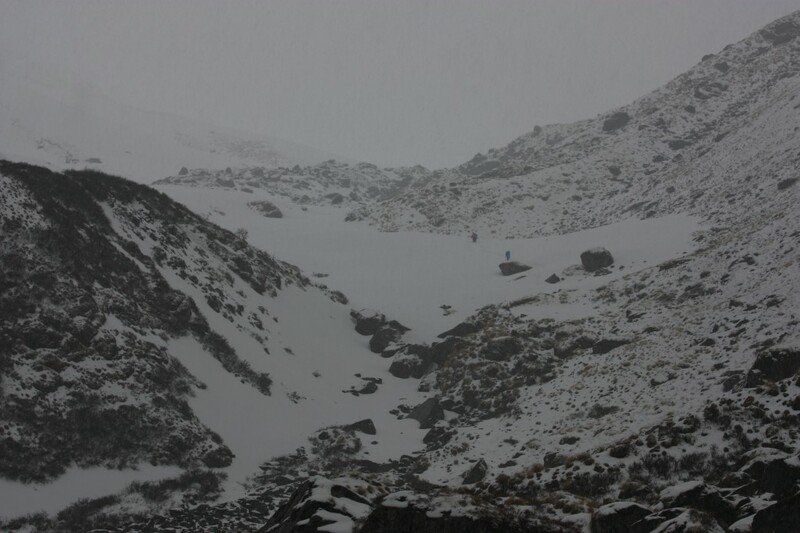 If these were unpalatable conditions for us, I shuddered to think what the conditions on the mountain were. As also the state of the various expedition teams who had laid siege to the her. I was sure there would be many. I went inside the room again to check on my fellow mates and walked into a serious discussion which had commenced. Considering the relentless heavy snowfall (one side of the lodge was already snowed in with the snow level having reached half the glass pane and inching higher by the second. Much later it had covered everything, including the roof), everyone was contemplating the future course of action and the variables involved. Reaching ABC was mandatory it seemed. Come what may. They wouldn’t return to this region again. So if it meant hiring a helicopter to fly to base camp, they would do so. I personally thought this was really pushing it and the ego had started emerging in what was a pressure cooker situation when decisions had to be taken. Getting stubborn in the mountains, in the final leg, is what is called ‘Summit Fever’. In our case it was ‘Base Camp Fever’. In such situations, there also emerges a dominant voice which takes over, clamouring for action, and influencing group decisions. So it was with the fellowship. Soon it was time to figure who would join this mini adventure. Multiple rounds of mildly aggressive posturing followed positions taken and questions asked. The fellowship was on the verge of splitting down the middle. The snowfall, the thunderous roars and rumbles around us were unrelenting. I looked up to the heavens praying for a clear window the next morning. We had no idea how deep the snow was and how deep it would become as the night progressed. Would it be safe for us to even venture out early at 5am the following morning? 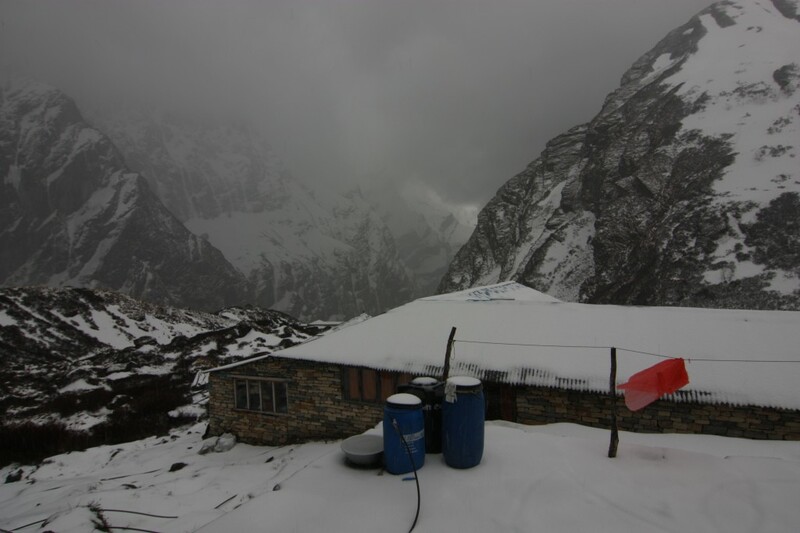 The dream of seeing Annapurna was bleak and fast receding. 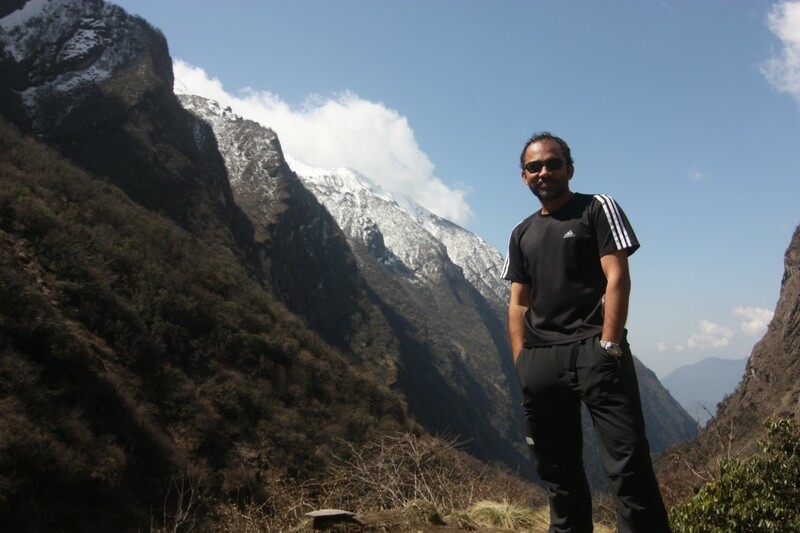 Varun and I would descend and head to Pokhara if the situation did not improve dramatically through the night and by early morning. On this both of us were in agreement. Meanwhile the helicopter had been arranged for a sortie from Pokhra to MBC to ABC and back to Pokhara at a cost of US$ 1800. This entry was posted in Events, Latest Journey. Bookmark the permalink. Thank you so much SujoyDa! Much appreciated that you visited the website and took time to read and surf.